Basil Brush can be called a national treasure of kid's tv. He seems to have amused generations of adults and children alike. In fact he's been entertaining for over 50 years! So when I heard that he was on tour and we got offered tickets I couldn't really say no to the fabulous fox that keeps on saying Boom Boom. I honestly didn't know what to expect. Me and Max have tuned into quite a few of the new YouTube videos they have produced but a stage show is always completely different as there were so many things to factor in. Especially as they have a lot of visual gags. I didn't need to be concerned at all though. 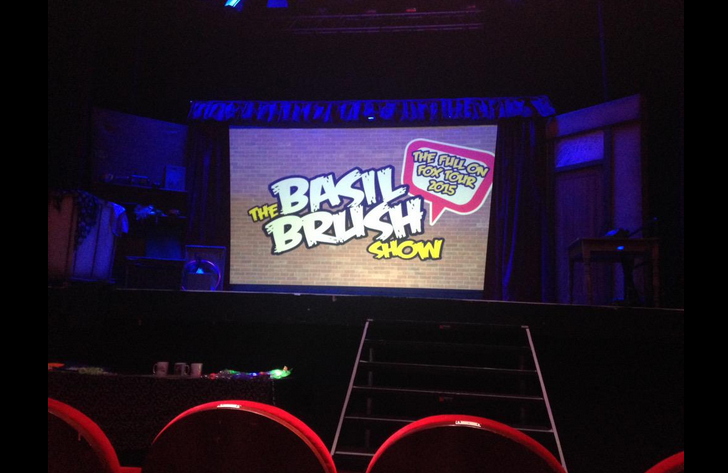 The show was packed full of gags that kept the kids laughing for hours. The 3 man cast did an amazing job portraying all the characters (including some ladies!). There is enough adult gags that will go completely over the kid's heads that the parent's won't be bored. Let's face it, some kid's theatre can be a little bit of a bore without something to entice the adults. Lots seemed to be there for nostalgia as well as for entertaining the kids. I was so impressed at the energy in the show that the time flew by and before we knew it we were in a queue to meet the guys themselves. Max was so chuffed that he got to stroke Basil and have his photo taken. It's all he talked about for weeks! My picture was a bit rubbish though. We loved this show. It's a great price for a great afternoon full of belly laughs and gags you will be talking about for days after. Check out the tour dates still left, I'm sure they will be headed to a town near you!